Aurèle Adam, graduated from Ecole Supérieure d'Electricité (Supélec-Paris) in 2000. He joined the research team of Alain Kreisler at the Laboratoire de Genie Electrique de Paris (University Paris VI – CNRS) and the group microelectronic of Erik Kollberg in the Chalmers University of Technology (sweden) for a coupled Ph.D. thesis. The subject was Hot Electron Bolometers for Far Infrared detection using Low or High Temperature Superconductors. In 2003, after his graduation, he went to Netherlands to become a member of the European Research and Training Network INTERACTION in the Kavli Institute of Nanoscience at the Delft University of Technology. He worked on developing a novel room temperature array detector for TeraHertz (THz) radiation. 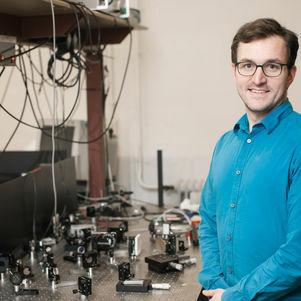 He also performed many experiments for the characterization of THz Quantum Cascade Laser in collaboration with the group of Qing Hu, at the Massachusetts Institute of Technology. He was then involved in the European project “TeraNova”, which was exploiting the radiation between microwaves and far infra-red, driving forward fundamental research and applications in this area (http://www.teranova-ist.org/ ). The core of his research is the study of feasibility and utility of near-field techniques at Terahertz frequencies. He has been investigating the use of a Terahertz near-field microscope for bioscience purposes. He started to grow his own interest on near-field techniques to understand THz light emerging from subwavelenth structures, demonstration of the presence of plasmons on the surface of such structures, and possibility to manipulate them for ultra-sensitive spectroscopic sensing at THz frequencies. Recently, he has proven that THz imaging can be a powerful imaging method for art historians, conservators and conservation scientists. Using a far-field detection set-up in a reflection configuration, he was able to distinguish hidden paint layers. In 2012, for the first time, his team, in collaboration with the group of Richard Averitt at Boston University, was able to measure and map the THz magnetic near-field created by split-ring resonator when excited by a incident THz electric field. The results provide a route towards hybrid devices for dynamic magneto-active control of the light. He contributes in more optical related work first in the absorption of infrared light in plasmonics structures for THz emission. In the past 3 years, his interest moves in the optics range, with an European Project OPERA in collaboration with Philips and others partners for developing the next generation of Light bulb based on LEDs. Lastly, he contributed to modern optical topics such as metamaterials, nano shells and optical antennas emission. A Veni Grant has been awarded in April 2007 by NWO (Netherlands organisation for Science Research) giving the opportunity to develop new ideas over a further three years. The subject is “Generation and manipulation of TeraHertz plasmons for Spectroscopy”. Assistant Professor at the Optics group since 2007.